Thoughts: It is increasingly getting harder and harder to review this comic every month. In part because the story is taking too long to pick up pace as a consequence of a limited page space and the fact that there are essentially three storylines happening within this limited page space. The other thing that's frustrating me about this comic is the premise and how that's negatively affecting the individual characters. 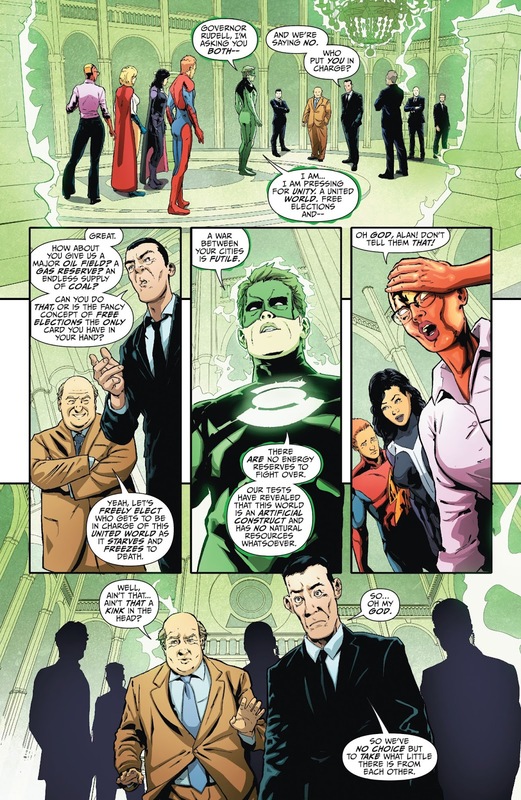 Since these characters are burdened with restarting their civilisation entirely from scratch, not only do they feel too far removed from the characters we associate with the Justice Society (even by Elseworlds standards), but it severely limits their opportunities for meaningful character development if they are constantly preventing war for reasons that range from limited resources to people simply not agreeing with the way things should be. By now, we should have a more established Justice Society team that formed naturally over the course of five years but we simply don't. What we have is a narrative that is an abrupt change from the original status quo and a Justice Society team (acknowledged for the first time in this issue) that is haphazardly comprised of heroes who barely know each other and have had zero opportunities to build any meaningful relationships with each other. 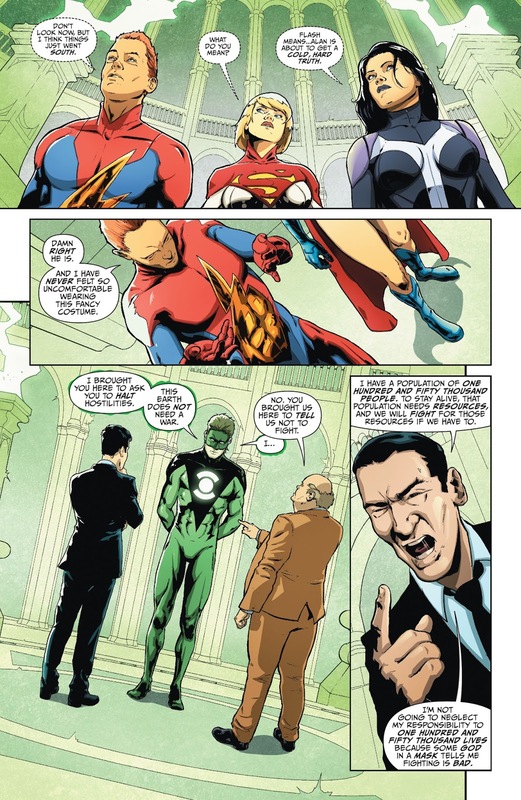 Not only are these characters being forced to work together under these circumstances because the story demands it, but it especially makes it difficult for me as a reader to truly invest in these characters when they feel like hollow representations of the characters I recognise as the Justice Society characters. The fact that they do little more than stand around and repeat the same information we already know four issues in doesn't really help on that front. On the front of story, there is very little that happens in this issue that makes sense or is worthy of discussion. Fury explains to Hawkgirl how she revived the Amazons, which was basically by using a storage device called the Pandora Vessel, which contained the souls of the deceased Amazons. It was established in this issue that sometime during the first Apokolips invasion (the one that killed the original Trinity), Fury stored the 'blueprints' of the massacred Amazons into this box, which immediately contradicts the fact that Fury was never with the Amazons during that time. It was established in both the original Earth-2 series, Worlds' Finest, and even Earth-2: World's End (as bad as that was) that Steppenwolf had kidnapped Fury when she was still young and had brainwashed her into serving him. As such, there is no way she could've been present on Amazon Island to collect those blueprints. The other thing as well is that when Fury explains to Hawkgirl how she actually revived the Amazons, it turns out that the people aboard her ship (called the Aphrodite) had succumb to radiation poisoning as a result of the initial crash-landing by Terry Sloane. This apparently means that Alan Scott failed to save this one ship when he used his massive power to protect all the Earth-2 survivors from death in Daniel H. Wilson's run. Since Alan apparently missed a ship, Fury used the Amazonian blueprints stored in the Pandora Vessel on the dying passengers to save them, effectively creating a symbiotic new race of Amazons combined with human DNA. On the Justice Society's side of things, Alan Scott arranged a meeting with the governors of both Erebus City and Ark Home to tell them to cease fighting as there were no natural resources on this imitation Earth to fight over. Everyone from Helena Wayne to Jay Garrick to Red Tornado acknowledged that sharing this knowledge was a bad idea and Kara Zor-L had no comment on Alan's blunder. Surely enough, the two governors validated the Justice Society heroes' concerns when they decided that they were going to fight to the death over the limited resources that are still available. The only thing that happened in this section that was worthy of mention (at least to me, anyway) is that Helena Wayne no longer has that dreadful, dehumanising scar on her face, effectively dropping the domestic violence victim look. The fact that she didn't have it in all of her appearances throughout this issue tells me that it wasn't an accident, and hopefully with the new artist (Federico Dallocchio), the scar idea gets dropped completely. Not only does Helena not need that look, but it also further distances her from Daniel H. Wilson's rather damaging take on the character that everyone would like to forget about. Lastly, there's Usurper Grayson's sub-story arc that ended with him magically subduing Hourman with 'anti-miraclo' because he suddenly expected to run into him in this issue, even though he was surprised to see him in the last issue, and was getting his own arse handed to him. He also apparently knows how to make 'anti-miraclo' because we're somehow expected to believe that an everyman who was never trained by Bruce Wayne and was living as a journalist prior to Earth-2's destruction is suddenly a master of chemistry. Considering all the other problems that already stack against this imposter character, this is unfortunately pretty par for the course. As has been previously discussed, this stock character literally lacks any real purpose for existing beyond functioning as a placeholder for Bruce Wayne. Without any character development and persistent marginalisation of the character who does exist with the right developments to succeed Bruce (Helena Wayne), readers like myself have no reason to care about this character or his story arc. He's not even really a character. He's just an editorially mandated waste of page space that could frankly be used to develop the other two sub-story arcs that are more relevant to the larger narrative writer Dan Abnett is writing. Overall, this comic continues to be a mess on too many fronts that count. Not only is Abnett forced to work with an editorially mandated premise that defies logical storytelling, but it's gotten to the point where the ship has already sunk. The only thing floating on the surface of the water at this point are pieces of wreckage that Abnett is attempting to assemble into a functioning ship. It's honestly a huge waste of his talent because Abnett can, in fact, write a better Justice Society comic. The problem is he doesn't have the tools that needs to do so with this comic. 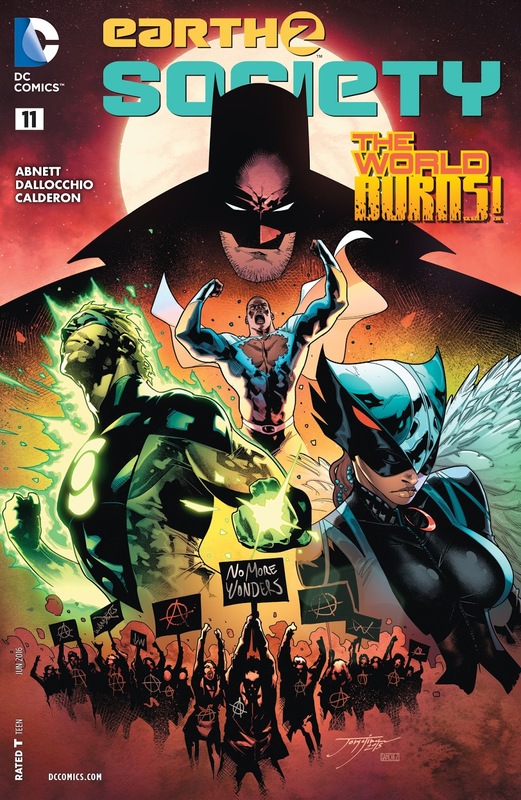 I honestly don't know who DC is trying to sell this comic to at this point since all initial interest in this title died when they killed the franchise with Earth-2: World's End. I honestly fail to see the merit of DC even continuing to publish this comic as is with sales as low as they are and especially with the more classic Justice Society returning later this year. I don't know what to expect out of the more classic Justice Society during Rebirth, but if it's the pre-Crisis Earth-2 characters we saw in Convergence, this title literally has no chance against it. Fans like myself will immediately flock over to those pre-Crisis Earth-2 characters like bees to a honeycomb because those characters are the authentic Justice Society. In my opinion, if DC wants to keep this version of Earth-2 for the New 52 fans, they should just hit the reset button and start over, but this time do it right. Burn this unpopular 'refugees of a dead world colonising an alien planet' idea to the ground and give these characters their Earth back. Use time travel to prevent the Apokolips war from ever happening on Earth-2 (kind of like how Convergence prevented Crisis on Infinite Earths) and let the characters develop naturally within the context of their established alternate history. The comic was more profitable when the premise was about heroes of a parallel Earth existing with an alternate history than when DC editorial inexplicably decided to turn it into a space opera about colonising alien planets. This comic, as is, has no future. That's just a fact. The thing that bothers me also about this book is the same thing that bothers you, the fact that one of my top 3 favorite characters ever is on two panels, when she deserves a whole series to herself, Helena Wayne. It's bad enough they took her off the other planet and now if they were to even think of giving her a series of her own adventures they'd have to use this half dead world as the backdrop? A lot of characters I love standing around trying to beg these two dimensional ungrateful people who should be thanking them for saving their lives being berated for simply having powers and saving those lives? The guy in the black suit really pissed me off. He wanted to fight no matter what the discussion was about and I wondered who put him in charge? I would love a new Justice Society book but that makes me wonder where would the characters go that weren't from the 40's, like Helena and Kara? There are so many Lois Lanes that at this point she needs a series that will collect the Superwoman version, the pre 52 version, and the current tornado earth 2 version, all together to stop and write an article about some pending disaster. I would read that, and that idea is not even half as messy as this series is. Dan Abnett is the Obama of the comic world, and this book is the equivalent of what was handed to our current president when he took over, and he's being told to 'make do.' He is because he's brilliant in my opinion but like you said, there's only so much that can be done. I wish he was allowed to clean up as he saw fit and I believe useless characters like this 'Batman' would disappear, or he would at least do something that made sense and find his son. I wonder if the Amazons have him, in a way it would almost make sense because he was left with Barda and the Tamaranean in that awful weekly book, Barda left but the Tamaranean could be asking for amnesty and still have the child. This book needs to be cancelled or rebooted. I was happy they got one of the best writers in the business seemingly to right the ship, but he's not even connecting the obvious dots that are already there, so I and other fans are left twisting in the wind wondering what's going to happen with this universe. They claim rebirth won't affect it, but how could it not? At best, Earth-2: Society is out of the hands of Eddie Berganza and Mike Cotton and has a new group editor, Jim Chadwick. Unfortunately, though, I don't think that'll do much of a difference on this title unless DC does a clean reboot and starts over.